Today was Day #6 of Chocolate and Holiday Spice Theme Week; and I tried the Winter Spice bar from Madecasse (Brooklyn, NY; Ambanja, Antananarivo, Madagascar). Made (in Africa)* with cacao beans from Madagascar, this 63% dark chocolate bar was infused with "warm spice notes and a gingerbread kick." Spices included ginger, cinnamon and nutmeg. The dominant flavor was spicy ginger (akin to candied ginger root) and faint spicy acidic fruit and earthy molasses notes in the dark chocolate -- making the bar taste slightly "darker" than 63% cacao. 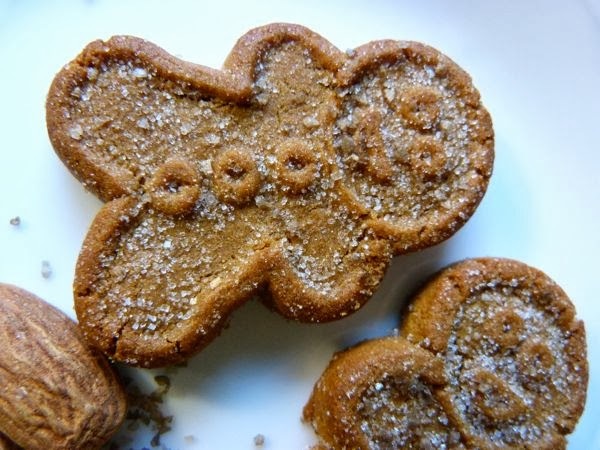 For dessert, I followed today's Madecasse bar with a pair of diminutive, gluten-free gingerbread men from Mi-del. These cookie men could be politely dunked into hot chocolate, or perched atop an ice cream sundae. In the future, after a long mountain hike outside in winter weather I imagine, I'll try dipping these gingerbread cookies, or hunks of freshly toasted gingerbread, into a high-end chocolate fondue. 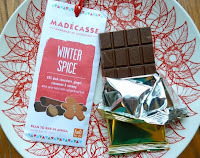 However, while today's Winter Spice bar was, thankfully, not too sweet, I've exceeded my sugar limit. Too many holiday treats this week. Right now, I want nothing more than a colorful holiday salad.